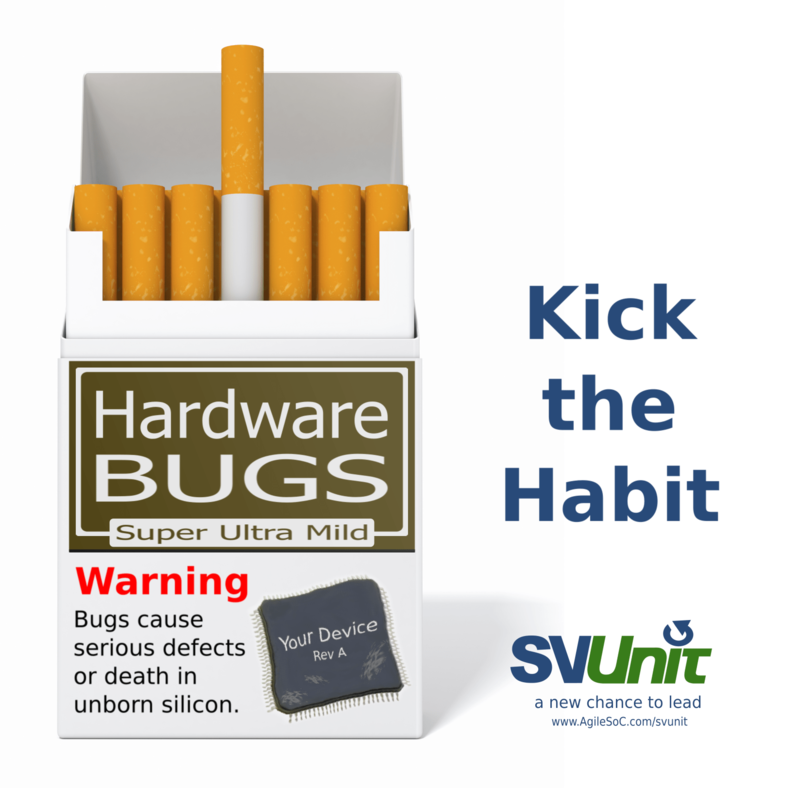 I used to accept bugs as a part of what happens in hardware development. Start a new project, write a bunch of code, deal with the bugs that inevitably arise, stress out about whether I can fix them before development milestones, cross my fingers that regressions pass the day before tape-out, repeat. After several years of acceptance I’ve started taking bugs personally. I hate bugs. They’re no longer acceptable and I’ve changed the way I write code to avoid the embarrassment of creating them. 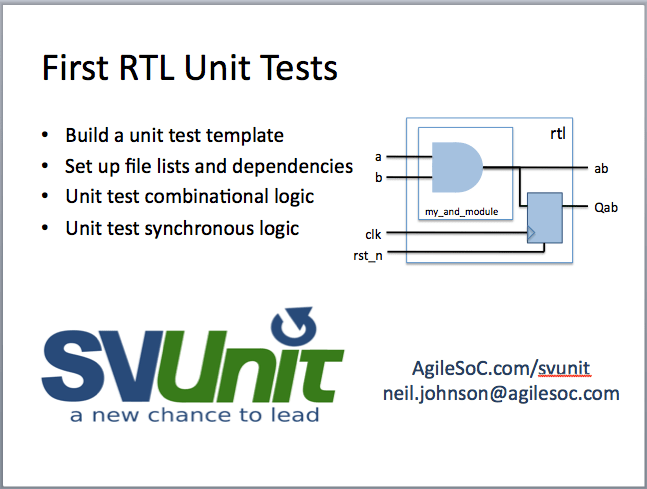 For me that means using SVUnit to unit test my testbench code as I write it. 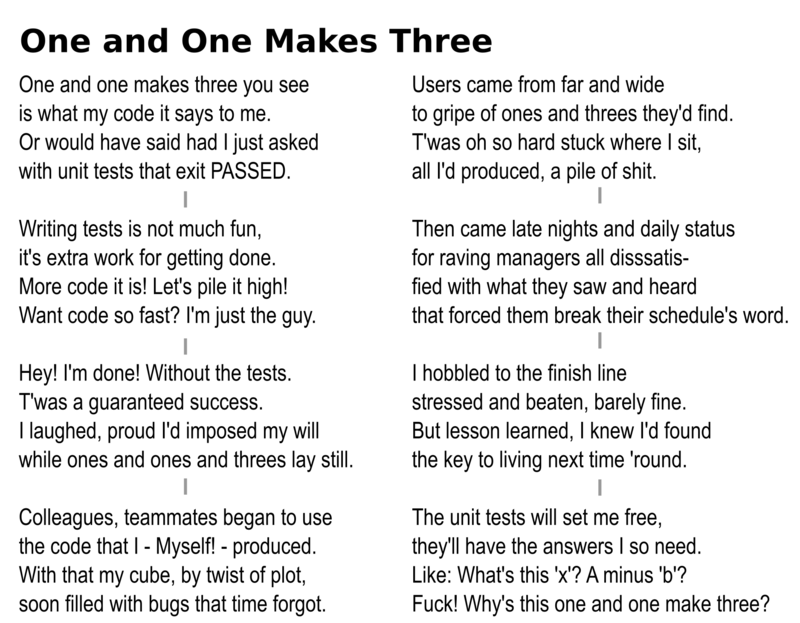 I’ve grown to attribute bugs not so much to developer ability or quality of specification or language or other commonly held positions but to the habits we rely on to write design and testbench code. 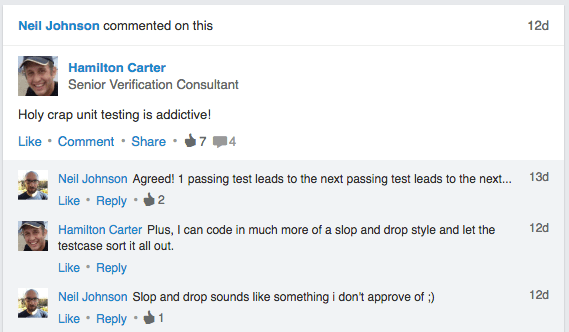 Primarily, I’m talking our debug later approach to writing code. Write the RTL then debug the RTL; write the testbench then debug the testbench. We don’t think about it, we just do it. It’s a habit. It kills our productivity, just like cigarettes kill people. Heads-up that we’ve moved SVUnit from Sourceforge to GitHub. This move was a long time coming, finally got it done a couple weeks ago. From now on, all new development will take place in the SVUnit GitHub repository. We may continue to post new releases to Sourceforge for a time while people sort out any download pointers, but I expect that’ll only last a few months. I still need to move open issues from Sourceforge to the GitHub issue tracker, but any new tickets should be filed on GitHub. One suggestion that came out of the SVUnit User Group Lunch last week during DVCon was a mailing list so that SVUnit users could keep in touch with questions, etc. Sounded good to me so I’ve set up an SVUnit User Group. It’s a google group. Anyone can join. With the lunch being a great first step (for me it felt like a giant leap) in building a real community around SVUnit, my hope is that this is the natural next step giving us users an online home to congregate and support each other. If you’re an SVUnit expert, someone entirely new to SVUnit or anyone in between, I hope you’ll join us in the SVUnit User Group to share your questions and experience! The last 2 days at DVCon have been about the best possible for SVUnit. Maybe even better than that. First was the poster sessions on Tuesday just before lunch. 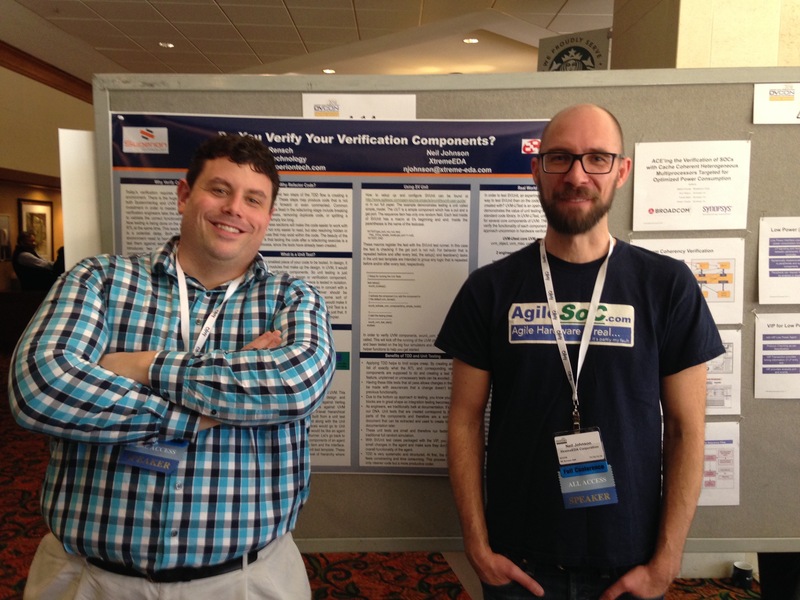 Josh Rensch and I had a paper called Do You Verify Your Verification Components. Being that this was my first time to DVCon, I had no idea how the turn out would be and/or whether or not people would be interested enough in the paper to stop and discuss it. To be honest, I had prepared myself to just stand there for 90min while people walked by. Thankfully that didn’t happen. Even though it was a paper about testing testbench IP that talked about TDD and SVUnit – none of which are remotely close to being mainstream ideas – people were actually interested. Lots of questions, lots of great discussion and I got the feeling there was actual acceptance which was a tad surreal. Credit goes to Josh for taking the lead on writing the paper and putting together the poster. He did most of the work. I was in the car on my way back to the hotel when I got a text from him saying we got a 3rd place award for the paper. Pretty cool. That was Tuesday. The highlight from Wednesday was the SVUnit User Group Lunch. Full disclosure: I was nervous about this from the moment we started planning it. Never before attempted by me. I wasn’t sure people would show up. That and I doubted we would have enough to talk about. Happy to say, though, that the lunch went better than I could have hoped. Way better. We had 18 people in total, which is about a dozen more than I thought was possible. 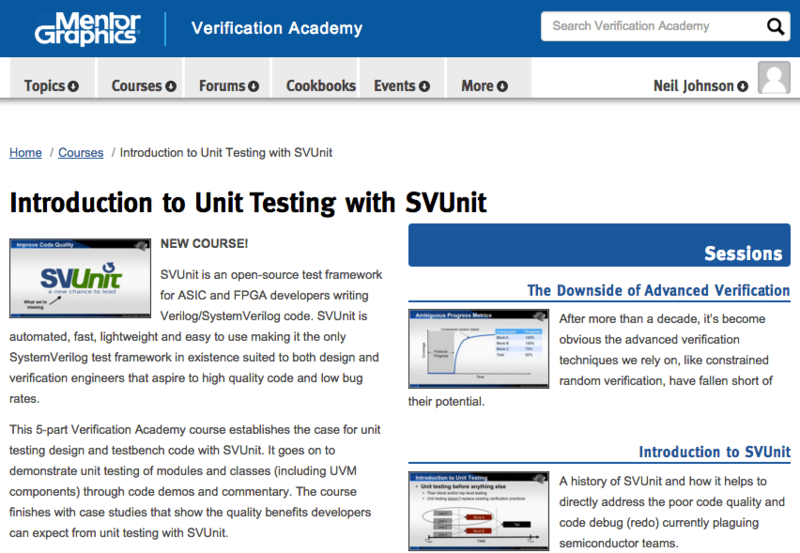 There was a perfect mix of experts, soon-to-be-experts, people who’ve been interested in SVUnit but haven’t had a chance to get started and others who didn’t really know much about it. I did my best to get the discussion rolling and then everyone else just kind of took over. It was ideal. Thanks to everyone that came to the lunch, spoke up, asked questions, chimed in with opinions, signed the SVUnit banner and posed for a picture (extra thanks to my colleague Rich DesMarais for organizing). It was a pretty special day. I felt like this was a big step in building a community around SVUnit. Hopefully, it’s the first of many!